Dear post houses: we need to talk. You're stepping on my picture. 1152p is not a thing. If you are doing your final post finishing in 2048×1152, you are actually hurting your picture, and you should stop at once. Here’s why. Did you notice anything there? Yep: none of those containers have more than 1080 lines of resolution. As far as DCI, SMPTE, your SDI cables, and Digital Cinema projectors are all concerned, “2k” still means 1080 lines of resolution or less. This turns out to be pretty important. If you are finishing in a 16×9 aspect ratio, and you’re finishing in “2k”, you’re actually going to deliver … 1920×1080. Which is HD. Likewise, if you’re finishing in 1.85 and “2k”, your actual deliverable is 1998×1080. Again, 1080 lines. Not 1152. But wait, it gets worse. Putting that extra 14% of spatial resolution into your DI can actually damage the picture that your audience sees. Why? Because your fancy, non-standard 1152 lines of resolution will have to be scaled down to 1080 lines of resolution. But that’s not a big deal, right? You just press the magic resize button, and there’s no penalty, right? It’s become conventional wisdom that oversampling is a good thing. Shoot 4k or 5k, finish in 2k or HD. No problem. I happen to agree with that, and Charles Poynton made an eloquent, 5-hour long argument to that effect at a recent talk at the HPA retreat. 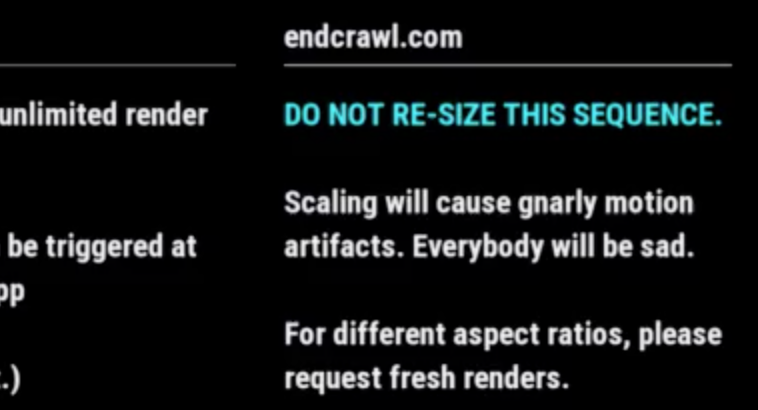 In plain English: a small resize factor will only serve to soften your image. You’re stepping on your image. You’re making it worse. You (or your client) may have thought that you were finishing in “better resolution” by “going 2k”. But since you have to down-res all deliverables—you know, the thing that your audience will actually see—that higher resolution is not only thrown away, but contributes to an inferior final picture. This is true for finishing in 1.78 (16×9) or 1.85. It’s not true for finishing in 2.39. If you’re finishing 2.39, stick with 2k, since you’re only at 858 lines of res anyway. But janky-looking end credits actually just illuminate a deeper problem in your overall post workflow: it makes exactly zero sense to finish in 2048×1152. If you shot in 2048×1152, there may not much you can do there. Sorry. But if you acquired your picture at 2.4k or higher, and your DI is not native RAW, then you should be working from RGB frames that are in the actual raster of your Original Aspect Ratio (OAR). Meaning either 2048×858, 1998×1080, or good old 1920×1080. Again, nothing wrong with HD. It’s great. For UHD/4k, just double all of those numbers. But don’t finish in 2048×1152. It yields no benefit and can only serve to step on your final picture. There are no 2k display or delivery standards above 1080 lines of res. The difference between HD and 2k is actually minimal and you shouldn’t care. HD looks great, even on large screens. If you’re finishing in 1.78 or 1.85, you should not be working at 1152 lines of resolution. This is very bad kung fu. Tell your post house, and if they are annoyed, just blame it all Pliny.